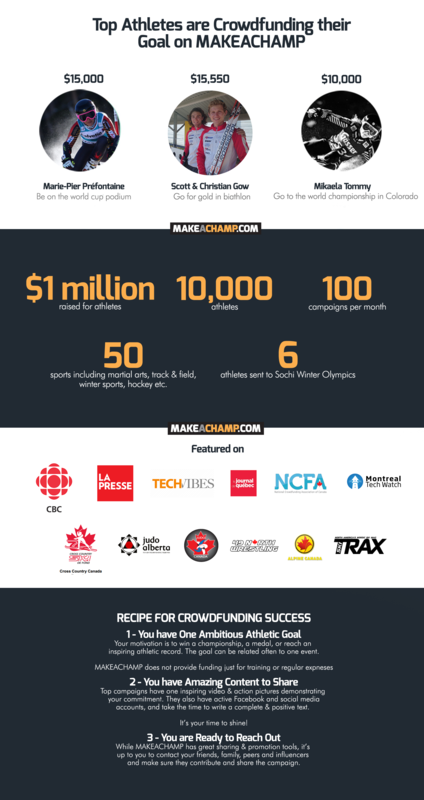 MAKEACHAMP is accelerating, with more than 10,000 athletes, 50 sports, 20 countries, 100 campaigns a month and more than $1 million raised as of summer 2014. And it's just the beginning, as we are preparing amazing products down the pipeline. More than crowdfunding, MAKEACHAMP is also an advanced platform for athletes to build their page, showcase pictures and videos, update their fans about results and important events, and build a fan base. In 2014, athletes who want to be successful also need to build their online presence. It's important to note that without a specific athletic goal, athletes cannot start a crowdfunding campaign. MAKEACHAMP does not accept either campaigns to pay for operating expenses. When a crowdfunding campaign starts, it's important that the athlete reaches out to their first circle of friends and family, colleagues, to get support and contributions in the first 48 hours! It's hard work, but in return, athletes will get valuable moral support, up until they become champions!